I love the tradition of sharing books with kids just prior to bedtime. It's something that fits easily into most families' routines and is a wonderful opportunity for kids to wind down while listening to stories. But there are some kids, and some nights, where winding down just doesn't seem to be on the agenda. Instead of lugging your little one to the car and driving up and down the street, can I suggest you try a sweet and soporific story instead? 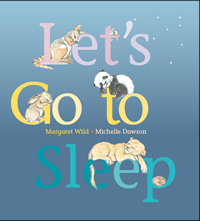 Let's Go to Sleep was written by Margaret Wild, illustrated by Michelle Dawson, and published by Working Title Press (2013). I've also reviewed Margaret Wild's books: Vampyre, and The Treasure Box. There are excellent teacher notes from Janet McLean to accompany the book. Hush! All over the world, in deserts and jungles, in woodlands and seas, little ones everywhere are going to sleep. Let’s Go To Sleep is the perfect bedtime book - guaranteed to give all small readers the sweetest of dreams. The stand-out feature of this charming children's picture book is the beautiful, poetic language. That makes it a great choice to use with students learning how to write poetry. Gentle imagery is well-supported by the choice of words, and there's lots of alliteration for young poets to find. Can you hear how the sibilance in this section echoes waves on the shore? Where silvery skies lie down in the sea, let's go to sleep, little dolphin. Having Michelle Dawson as illustrator is an inspired choice. Her delicate, dreamy sketches with muted colours depict baby animals from allover the world settling down to sleep. Each page shows a new baby animal in its special environment, accompanied by a loving parent. There's still time to prepare for Children's Book Week! If you're looking for activities to do with kids, check out Last Minute Ideas for Children's Book Week Australia 2013. This is definitely a sleepy time book!